Well, we only ended up doing one episode this year, contrary to my hopes last fall. But production of the next show is well underway, and it's as different from the Diplomacy show as that one was different from the shows that came before it. Once it's done, I'm going to release it in a brand-new format that, I hope, will make the show much more watchable, without sacrificing any show quality. You'll know what I'm talking about once you see it. I'm hoping that 2010 will be the year I can actually bring some regularity to this show's production schedule, enough so that I can say "I make a TV show about games" without feeling obligated to qualify that with some statement about its near-nonexistence as a regular series. I do indeed have a plan for making this happen that is better than "OK, let's just work harder at it." But, in the interest of not jinxing myself, I'll save further yapping about any new process for when I actually deliver something. To tide you over, please enjoy this historical confection that PeterB over at TLeaves dug up. Wargames! A unique and intriguing hobby. Tags: the gameshelf, videos, wargames. Tags: book of ti'ana, iphone, movies, myst, mysteriacs, riven. It's that time again. Please join us for the monthly Boston IF Meetup on Monday, December 21, at 6:30 at MIT in 14N-233. This month, we'll take a look at the Textfyre game The Shadow in the Cathedral, and we may also see a work-in-progress game or two. And of course there will be the usual general chit-chat about IF and games in general. As usual, we'll head over to the Cambridge Brewing Company after a while for food/drink. Tags: boston, if, interactive fiction, meetup. Tags: boston, get lamp, if, jason scott, pax. YouTube review by me of the original M.U.L.E. is here, if you need some background. Last night I played a couple of games of the brand-new Planet M.U.L.E. - one with some friends over the internet, and one by myself. 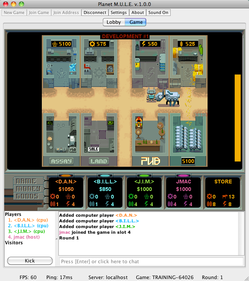 It is a faithful (sometimes a little too faithful) adaptation of Dani Bunten's original economic simulation from the 1980s, and it does indeed finally meet the long-time dream to bring internet playability to this intrinsically multiplayer game. Unfortunately, at least in its current version, Planet M.U.L.E. is marred by some design choices that will, I fear, significantly limit the size of audience. Continue reading Planet M.U.L.E. - First thoughts. Tags: adaptations, digital games, games, internet games, MULE, reviews. I got into The Mob on 1 vs. 100 tonight, after several personal-best high-scoring rounds, and then blew it on the first question. Yes, I said that the act of swishing liquid inside your mouth was to gaggle. Because it was the first choice that appeared, and because I was freaking out about being in the Mob. So, if you ever play the game and wonder what the hell kind of idiots got that wrong? when you see the inevitable group of Mob knockouts after the first, always-easy question, I am here to tell you: some people just don't act their fanciest under sudden stress. Tags: 1 vs 100, digital games, game shows, games, xbox games. Continue reading IF activity at PAX East -- now with info!. I'd be less sad about this if Microsoft were more like Apple (ha ha) when it comes to repairs. If your under-warrantly MacBook dies, the truck delivering your repaired machine nearly runs the truck picking up the broken one off the road. Microsoft's Seattle attitude is rather more shall-we-say relaxed than that of their high-strung Californian competitors, and you can expect a solid month to pass between the day those red lights start flashing and the day you can once again get down and dirty with whatever your high-def poison is. A more astute comparison might be how my Atari VCS lasted a good 11 years before it experienced any kind of hardware failure... but that was a rather simpler device. Are modern consoles' hot-running guts just too complicated and failure-prone for users to expect to work for any long stretch of time? Tags: atari, digital games, xbox games. Andrew Plotkin's landmark work of interactive fiction Spider and Web has been translated into Russian by Vsevolod Zoubarev. That's a pretty great initial translation choice for this particular game, what with its vibe of Eastern European-ish intrigue. Tags: digital games, games, if, interactive fiction, zarf.